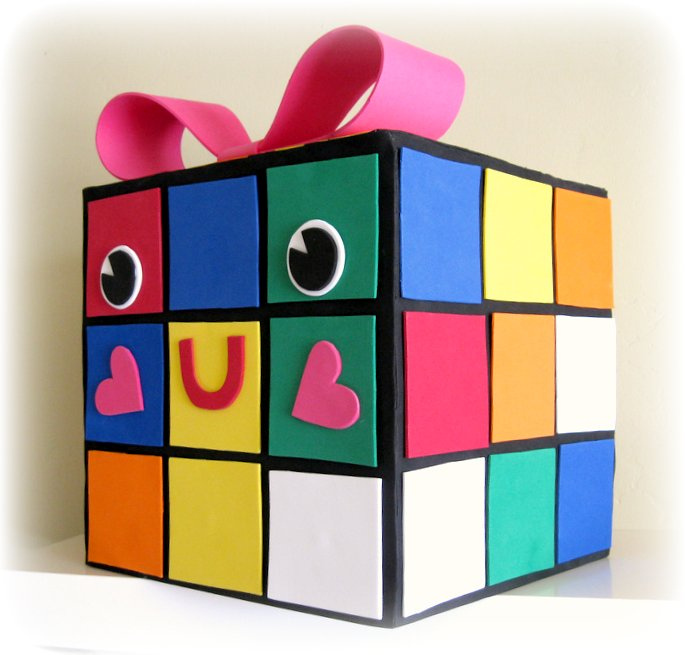 I'd like to introduce you to my newly made, *SQUEEEE*-inducing Valentine box, Rubie. Oh, yeah. She IS that cute. I may not have kids, but there is a big one living inside of me that just screams to come out sometimes. All the time, really. Luckily, I work somewhere awesome where the whole department still holds Valentine box contests! Tape up the box so it will securely hold its shape. Then cut a whole in the top so the Valentines can slip right in. Next, cut all of the foam sheets (except the black and pink ones) into 3" x 3" squares. Hot glue the black foam sheets to each side and top of the box and trim to fit. I left the bottom uncovered. Then arrange the colored squares as you see fit! It's best to keep it looking similar to how a real Rubiks cube would look, because after all, there IS a pattern to the madness. Once all the squares are glued on, make any kind of eyes and mouth you like. 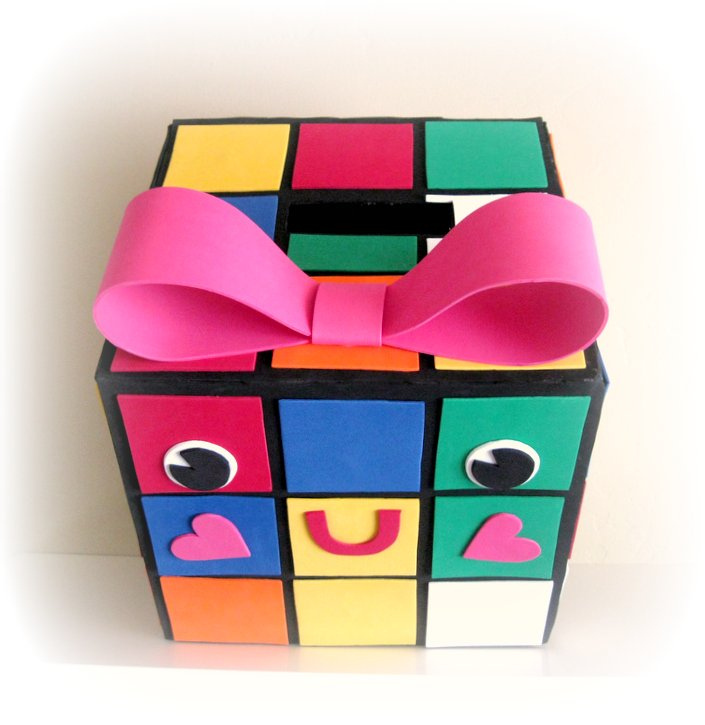 If your Rubie box is also a girl, don't forget to make a nice, big bow to place on her head! If your Rubie is a boy, you could do a bow-tie instead. I was able to make Rubie in about 2 hours total. Hot glue and easy-to-cut foam sheets make it super quick! It wasn't, however, as cost-saving as I was hoping it would be. I did have to buy the square box itself and each foam sheet was .99 cents. I spent about $13 total. I'm glad I didn't skimp though, because cute little RUBIE is now a part of our clan. 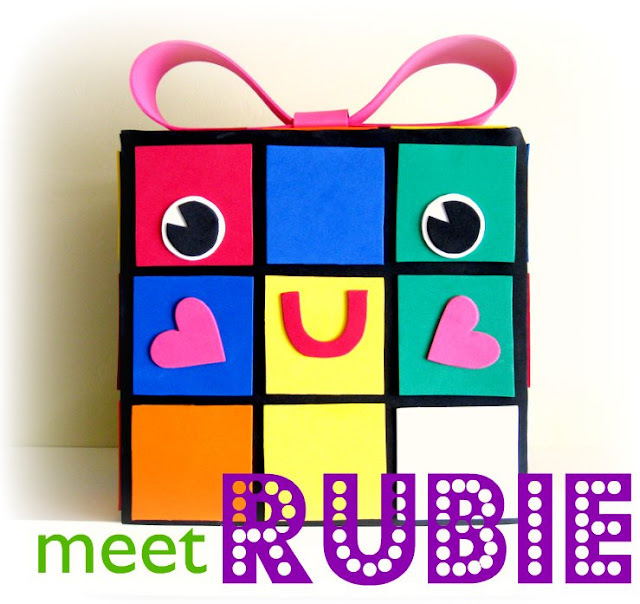 If you make a Rubie for yourself, PLEASE link up a picture in the comments! I would LOVE to see it. This is so cute! I'd love for you to come share at Fun For Kids Friday! So glad you linked this up- it's just too cute not to share! I shared a link on Twitter as well! Hi, I just finished my own mini Rubie! I found yours on pinterest & it was so cute, I had to make one myself. I work at a pediatrician's office & we're having a Valentine box contest... Wish me luck! Thanks for the inspiration! Thanks so much for this great idea! My daughter LOVES her Ruby box and cannot wait to show it off to all of her friends at school! 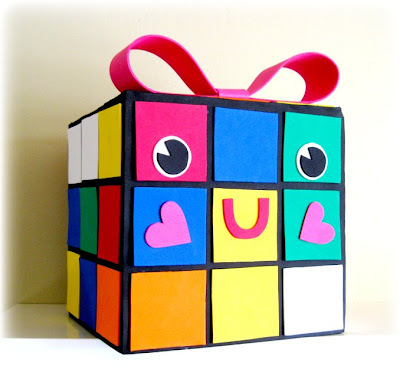 1) There are two green center pivot pieces, indicating there are two green sides to the cube when completed. 2) On the bottom right corner, two of the three faces of the corner are white, which is impossible on your standard cube. 3) Again, on the top left corner, two of the three faces are red. Just finished mine!! Everyone is loving it! !